That is awesome, thanks for sharing LJ. Thanks for that LJ, any chance of a close up of Lake Eyre as it fill's ? Well I've been saving an image every day so I'll keep an eye on it. That would be a great sequence to see M8. Thanks! If a cyclone develops in the Gulf, is that flooded area large or deep enough to help feed the cyclone, should be warm enough. A tropical low (17U) is forecast to form south of Bali today (Thursday). 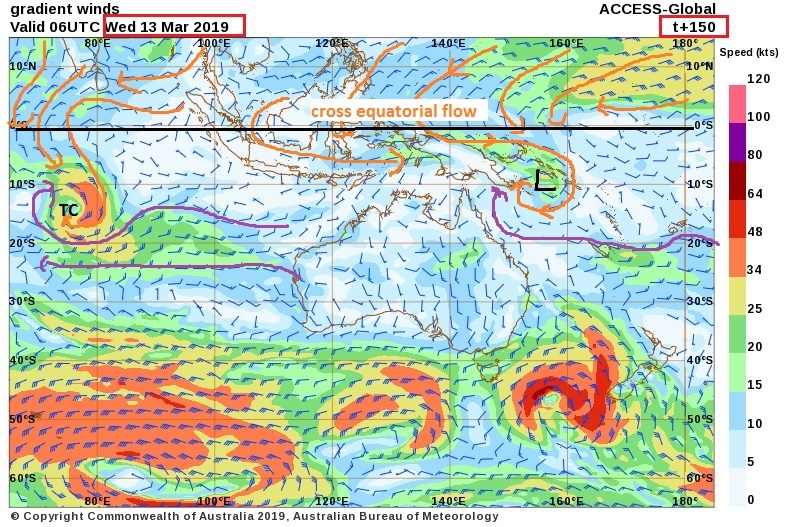 If it does form, it is expected to track in a west to southwesterly direction and gradually develop, and pass close to Christmas Island late Sunday or during Monday. There is a Low (less than 20%) chance of this system developing into a tropical cyclone on Saturday and Sunday, increasing to a Moderate chance on Monday. Noticed WA haven't had much happening this 18-19 season, anyone know what might have contributed to this? Just one thought 'mycirrus'. From the perspective on mslp patterns. There has been a high pressure anomaly over the NT regions and surrounds were the nursery for cyclogenesis and then NW/WA systems emerge. Thanks crikey. So a persisting higher pressure keeps sitting around the top end? preventing cyclogenesis. Does that boil down to the luck of the draw with weather systems? or is there a driving factor behind that. Would La nina and El Nino events play a role in this? There are many here on the forum that study climate drivers and l am sure they will give you some input. I myself ...certainly don't ...believe in luck of the draw. I believe that a number of interacting climate drivers are likely to be involved. and l believe the synoptic in the NH is important as well for positioning of strong cross equatorial flow. and the above is probably not exhaustive. This looks to be a good article for a start. I must read it all myself..
"The variability in the rainfall onset has largely been linked to the El Nino Southern Oscillation (ENSO) with it starting earlier in La Nina years and later in El Nino years. " and wouldn't you know an el nino is forecast this year. 7 registered (Homer, martyface, Multiversity, Anthony Violi, bbowen, divho, 1 invisible), 54 Guests and 2 Spiders online.